At the VR Arcade Amsterdam we wanted to build a VR experience that would be unlike any other. For that we gathered technologies from multiple vendors and combined them into one unique experience. Our game, Apocalypse, lets players walk around freely in a large environment. In that large space, they will face a relentless horde of zombies and fight their way through the game. The great magical thing that makes it all work is the way players can actually walk around in VR. Regular consumer-grade VR doesn’t offer a truly large area to walk around in. You lose your sense of immersion, of being in the game, as soon as you feel the cord of the headset, telling you there is no more space available. But once you walk around in our game, you can actually let yourself believe you’re somewhere else. Of course, a great deal of our system depends upon Qualisys. By using their camera system, we can track our players in real time and place them in our virtual environment. 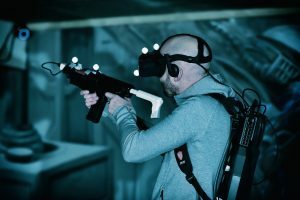 The system allows players to bunch up when they’re scared or lets players run around to get away from the zombies without us worrying about the camera’s or other technical problems. Thanks to the Unity3D plug-in, the only thing we have to do is start Qualisys Track Manager on our server, let the players connect to QTM and receive the correct rigidbodies. Our Unity3D server handles player networking and QTM provides coordinates for the player’s headsets and weapons. This saved us a lot of time building the required code from scratch and it meant we did not have to worry about the complicated math that goes into the calculations QTM does for us.